People are typically divided into two major groups – the feline lovers and the canine lovers. And although the question of which is better, a cat or a dog, has been around us for so long, we can say that no universal answer can be given. All animals are to be respected and loved, and it is just a matter of personal preference as to which you will keep as a pet. Cats have been domesticated for many centuries, and their first purpose was to help in keeping the household free from mice infestations. And now, a few thousand years later, the result of such domestication is hundreds of different cat breeds. One of the most popular breeds around the world is the Somali cat. But what is so fascinating about them and is its nature suitable for a family with children? Let’s go ahead and find out. How much does a Somali Cat cost? Talking about the personality of Somali cat, we can safely say that it might be the friendliest feline type out of all cat breeds. They are safe to keep around other animals (they do pretty well whether they have a dog or a rabbit as a companion), and the most important thing is that they are pretty friendly with kids as well. This makes Somali cats the perfect choice for a family with children and other pets, and due to their active nature, you can be sure that it will be loads of fun to have one in your home. The answer to this question is not that simple, but as the Somali cat descendants were from Abyssinia (Ethiopia), they are thought to have originated in Somalia, which borders it. 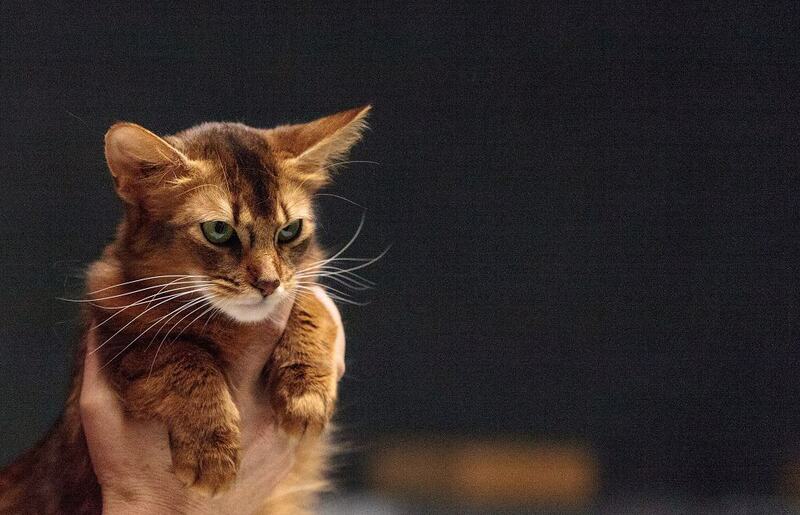 During the 1950s, one particular breed was massively owned in Great Britain and it was the Abyssinian cat. Originating in modern-day Ethiopia, people enjoyed its rabbit-like looks and loved the fact that, unlike some other feline breeds, this one was quite friendly. As a result of massive breeding, certain litters ended up with a number of long-haired Abyssinians. In that time, it was seen as undesirable, but very recently some people became quite fond of the long-haired trait and so the Somali cat came to existence. Now, 60 years later, Somali cats are much more popular than the original Abyssinian cat. While Somali cats are usually seen as a healthy breed, there are still a number of inherited conditions that could occur. Out of all of them, the most common is periodontal disease, which is fairly common in other cat breeds as well. Along with that, Somali cats have a chance of developing the over-grooming condition which is called hyperesthesia. Detecting it shouldn’t be hard and it usually manifests through excessive grooming and licking. Renal amyloidosis is an inheritable condition that can be treated if detected on time. If not, it can eventually lead to kidney failure. Somali cats are also known to develop retinal atrophy as a consequence of rdAc allele mutation. When it comes to height and weight, the Somali cat is average in size compared to other common breeds. Both the males and females range from 8 to 12 lbs., and can reach up to 30 cms in height. A typical Somali cat has either green or gold eye color and a long smooth coat. Due to the fact that Somalis are long-haired, you will need to spend an adequate amount of time a few times a week grooming and nourishing their coat. These cats shed throughout the year, with a positive thing being that they are not allergic to external factors such as pollen, dust, etc. As of the colors, Somali cats are red, blue, fawn, ruddy, and sorrel. 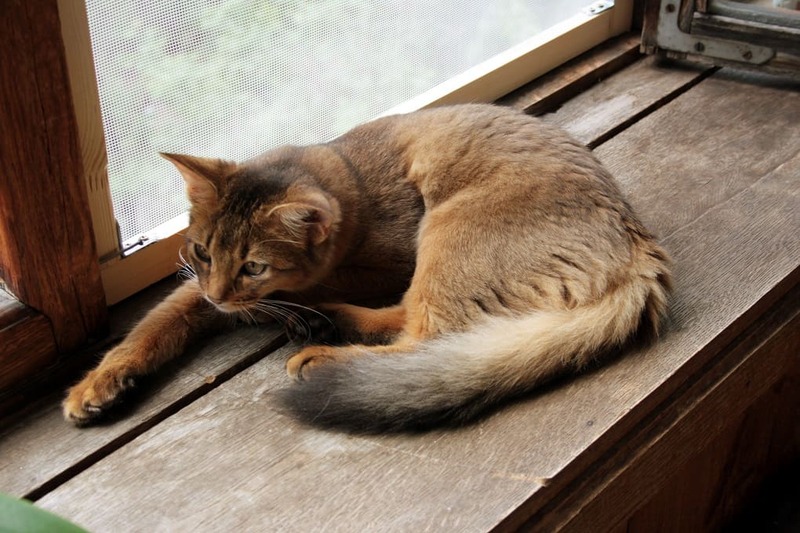 To a lot of people, the looks of a Somali cat is foxlike mostly due to their tail and ears that always seem to be up. Those ears are a screen into their personality, meaning that they are always up for playing and jumping around. With their triangular head and almond-like eyes, there is no doubt why Somali cats are considered as one of the most attractive cat breeds. The average lifespan of a Somali cat ranges from 9 to 13 years, although it can be exceeded with proper care and the right conditions. As mentioned above, they have a playful personality, and you can expect that your feline friend is going to be friendly with your children and other pets as well. While you might think that letting your cats out for a roam in nature is a great way to make them happy, it is not recommended with a Somali cat. Due to their friendly nature, Somali cats might get stolen or attacked by other animals, as well as pick up various outdoor parasites and develop life-threatening conditions. That is why providing the right living conditions for your cat inside the home, and maybe in a fenced backyard play area is the best thing you can do. 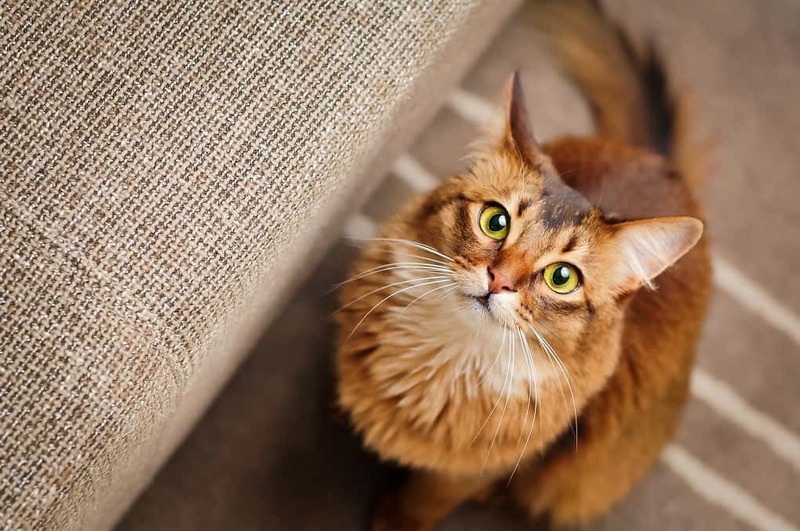 While Somali cats don’t require too much care, you should still brush their coat at least a few times a week, and be sure to regularly clear their pointy ears. Along with that, use a wet cloth to clean the corner of their eyes, and be sure to cut their nails every few weeks (especially if your cat is indoors most of the time). Lastly, you shouldn’t forget to regularly brush your cat’s teeth to prevent premature periodontal disease. If you live in the US, Australia, or Europe, chances are you have at least a few local breeders close to your area. It is one of the most common domesticated feline breeds and is recognized by the TICA, CFA, as well as the ACFA. We recommend that you check the breeder's history and feedback from previous buyers before deciding on the cat you want to purchase to ensure that the cats are not inbred. While the price might vary depending on where you live and what kind of breeder you are buying from, the average cost of the Somali breed ranges from $1,000 to $1,500. Once again, if a Somali cat is too expensive for your current budget, we recommend that you don’t buy one until you are ready. Buying a cat at a cheaper price and from an unknown breeder might result in a variety of inherited health conditions and vet expenses. As we mentioned above, if you have a family with children and other pets, and you want to get a playful feline friend, a Somali cat might be the right choice. Choosing a perfect Somali cat shouldn’t be that hard and there are just a few things to consider. First, you should look into a breeders history and check if there were any possible accusations of inbred litters. Along with that, once you come for a visit and get to see the potential litter, you should look for traits such as almond-shaped eyes (green/gold), triangular face, and a small foxlike tail. If the cat is any color other than red, ruddy, fawn, blue, and sorrel, it is a sign of possible mix-breeding and it shouldn’t come into consideration unless you want a mixed-breed cat. The color should be lighter around the neck, and soft to the touch. Last, you should choose the cat that seems to be most playful and interested in human interaction. Much like any other pet, cats need attention and care. Still, Somalis are pretty easy when it comes to human care and your main responsibility is to keep them active and engaged. That will not be hard, especially if you have kids or other pets (especially cats) around the house. Apart from that, you will need to groom your cat a few times a week in order to keep the coat healthy and provide them the right dental care. As mentioned above, Somali cats are a healthy breed (for the most part), and with the right nutrition and attention, they should be able to safely live for more than 12 years. And while outdoors might seem fun, we suggest that you invest in proper indoor and backyard equipment instead of letting them roam around the streets. Somali cats usually come with a ticked-like pattern and a long, silky coat. Given the behavior of this breed, we can safely say that it is one of the most family-friendly cats you can get. Unlike some other breeds, Somalis are affectionate and love children. Apart from that, you shouldn’t have a problem even with other pets around the house, even if you get your Somali cat after them. What you should keep in mind is that Somali cats are extremely active and need space where they can climb and jump. Along with that, they are intelligent and know to get around certain barriers. With proper attention and care, you can be sure that a Somali cat is going to be a great addition to your family. Given the few types of a Somali cat, we can only make a distinction between those that differ in color. While all Somalis come with a ticked-like pattern, there are five main colors this cat can come in: red, fawn, sorrel, blue, and ruddy. When compared with other common breeds like a Persian cat, a Somali cat is much more affectionate as well as dog and child-friendly. Apart from that, Somalis widely resemble Abyssinians and share a number of common traits with them. If you are a fan of felines and you are looking for a breed that is dog and child-friendly too, a Somali cat is a perfect choice. It is playful and affectionate, and given its looks, it will become the main attraction in your household.